They boast significantly higher yields -- and a longer stretch of payout raises -- than the global sportswear giant. Footwear and sports apparel titan Nike (NYSE:NKE) isn't likely to show up on many income investors' stock screens. After all, it's the second-lowest-yielding stock in the Dow, in part because management is investing aggressively in the business rather than returning more cash to shareholders. Its 14-year streak of dividend boosts, meanwhile, isn't enough to qualify Nike as a Dividend Aristocrat. Yet you don't have to venture out of the retailing and apparel sectors to find heftier dividend payouts. Let's examine two comparable stocks -- VF Corporation (NYSE:VFC) and Wal-Mart Stores (NYSE:WMT) -- that income investors might prefer over Nike right now. The North Face is one of VF's biggest brands. Image source: VF Corporation. Even if you haven't heard of VF Corporation, you likely are familiar with its global clothing brands that include The North Face, Vans, Timberland, Wrangler, Lee, and Nautica. VF has been around since 1899, and its product portfolio spans the key apparel categories of sports, jeans, outdoor, and style. The company just closed the books on a tough year in which revenue ticked higher by 1% and operating income held flat at $1.8 billion. In contrast, Nike's sales are up 5% over the last six months as profits have surged 21% higher. Those divergent business trends help explain why VF's stock is down 22% in the last year while Nike's is up by about the same margin. 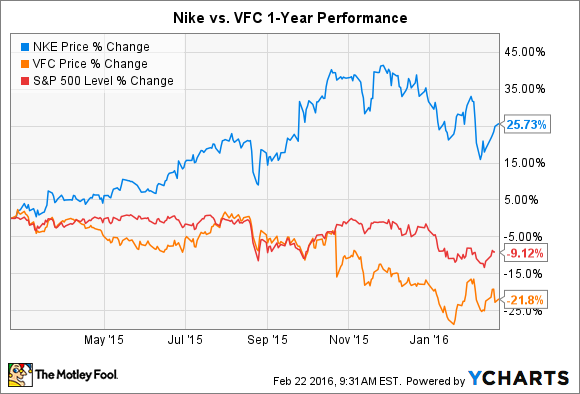 Yet those swings have helped VF's dividend yield climb to more than double Nike's. The company also boasts a heftier payout ratio, at roughly 50% of earnings, and its 22% hike this year demonstrates that management is serious about returning cash to shareholders. Finally, VF's commitment to a steadily increasing dividend is illustrated by its 42-year streak of annual payout hikes. Fellow Dow component Wal-Mart's latest fiscal year wasn't especially strong, either. Revenue slipped by 1% (but rose by 3% after adjusting for currency swings) and earnings fell 8% as the retailing titan ramped up spending on everything from better store design, to a stronger e-commerce infrastructure, to higher employee wages. Yet two critically important metrics for income investors -- cash flow and dividend yield -- are pointing up even as operating trends disappoint. In fact, Wal-Mart generated a record $27 billion of cash flow over the past 12 months, which was easily enough to fund massive cash returns to shareholders: $10.4 billion in 2016 alone. What's more, thanks to pessimism around its short-term profit growth potential, the stock's yield has climbed to above 3%, which is far ahead of the historical average for this business. 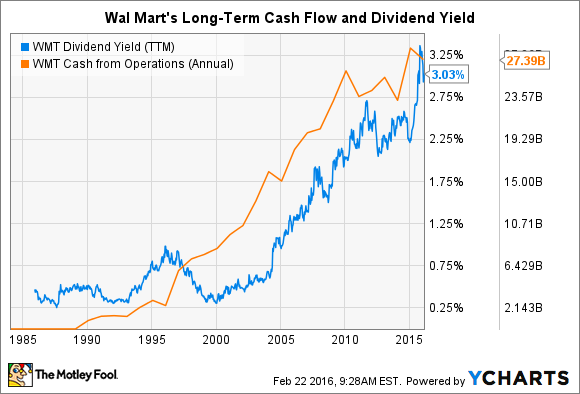 WMT Dividend Yield (TTM) data by YCharts. Yes, Wal-Mart's spending plans and its latest tiny dividend hike suggest that investors who buy the stock now aren't likely to see big payout growth over the next few years. But the payoff for that sluggish outlook is an unusually high current yield that's 3 times Nike's and also well above the average for the stock market as a whole. In my view, VF is the better overall dividend stock at today's prices. It sports a hefty yield, a fast-growing payout, and a decades-long streak of dividend hikes. Valuation also tilts in VF's favor: The stock is valued at 25 times earnings, a significant discount from Nike's 29 times earnings multiple.